How far from St Andrews? 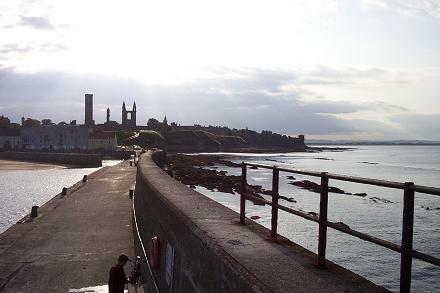 Looking back at St Andrews from the end of the pier. So, to encourage members who would find it difficult to come to St Andrews they are meeting in Dundee. Which is 12 miles from St Andrews! And 12 miles further north at that. I’m sure as Hedge knows all too well, St Andrews is Scotland’s University, and Edinburgh a mere modern academic ankle-biter that can hardly claim half of Scotland’s University’s pedigree (although I did go to both of them myself!). … and a academic institution based on secular principles too, unlike Scotland’s University which was founded by our Lord’s apostle, Saint Andrew, himself! By the way, this photo was taken last summer (2004). It was my first visit in years where the pier was open, having been closed for repairs for some time, I believe. 1. The Sunday Times Good University Guide: Edinburgh 12th, St. Andrews 14th. I don’t study English. You can blame Dunfermline High School for the terrible grammar, spelling and punctuation.